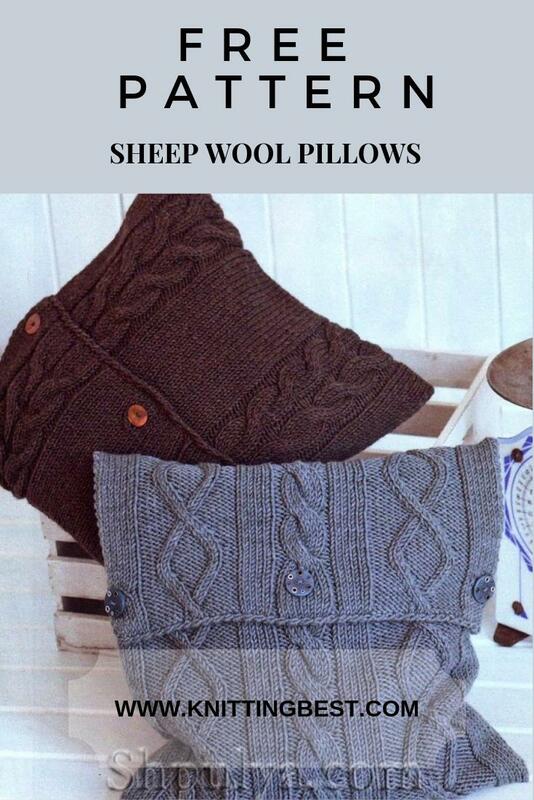 You will need: 350 g of blue and 350 Bingo brown yarn (100% wool, 80m / 500g); straight needles number 6; hook number 5, 3 buttons for each pillow. Facial smoothness: persons. p - individuals. n., izn. R. - ex. P.
Applies to all subsequent patterns: the diagrams show persons. R. In izn. R. knit loops on the pattern. Pattern of braids A, width 18 p.: Knit according to the scheme 1. Repeat from the 1st to the 20th row, finish the 1st and 2nd p.
Pattern of braids In width 12 p.: Knit according to scheme 2. Run 1 time from the 1st to the 22nd row., Finish 23rd -32th row. Pattern of braids With a width of 18 points: knit according to pattern 3, repeat from the 1st to the 12th p., Finish with the 23rd -32th row. Work description: starting from the inner edge, dial a cross-shaped set of 72 points and knit as follows: chrome., 6 points of persons. satin stitch, 18 p. patterned braid A, 5 p. stitch, 12 p. pattern of braids B, 5 p. satin stitch, 18 p. patterned braid A, 6 p. stitch, chrome. Through 80 cm = 184 p. from the set edge ends the main part of the pillow and the valve of the pillow begins. To do this, make a mark on both sides. For holes for buttons after 12 cm = 28 p. from the mark close the 4th, 5th p., the 36th, 37th p., as well as the 68th, 69th p. and in the next side of the p. re-dial. Through 16.5 cm = 38 p. from the mark or 96.5 cm = 222 p. from the edge of the dial close all the loops. The cushion detail should be folded in half with the front side inward, with the marks coinciding with the typesetting edge, and the side seams should be sewn, Sew buttons. Crochet the valve cushion 1 p. rachogo step (= Art. b / n from left to right). Job Description: use a cross-shaped set to dial 72 points and knit the main part of the pillow, like a blue pillow as follows: chrome, 8 points. stitch, 18 p. pattern of braids C, 8 p. stitch, chrome. For valve cushion through 80 cm = 184 p. from the typesetting edge knit further in accordance with the pattern. For button holes through 15.5 cm = 36 p. from the mark, close the 4th and 5th paragraphs, the 36th and 37th paragraphs, as well as the 68th and 69th paragraphs and in the next edition. R. re-dial. After 20 cm = 46 p. or 100 cm = 230 p. from the edge of the dial close all loops. Run side seams.